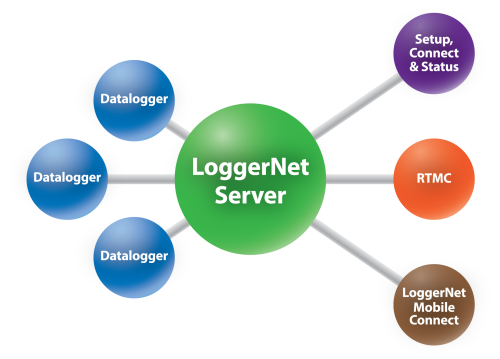 We’ve recently had an exciting new addition to our family of LoggerNet datalogger support software. In this brief article, I’ll introduce you to this mobile app and tell you how you can get it free of charge. You are probably familiar with LoggerNet, our PC-based software product that is used to communicate with, program, and collect data from Campbell Scientific data loggers. LoggerNet consists of a software server that runs on a PC, as well as several "client" applications. The clients connect to the server, and the server, in turn, connects to the data loggers. Similarly, the data loggers connect to the server, and the server then sends the data logger messages to the clients. In mid-January, our newest LoggerNet family member arrived: LoggerNet Mobile Connect. LoggerNet Mobile Connect is a mobile app that runs on iOS or Android devices. The app connects to the LoggerNet server in a manner similar to any other LoggerNet client. With LoggerNet Mobile Connect, you can use a tablet or smartphone to connect to any LoggerNet server that is accessible via TCP/IP. That means that you can use your mobile device to connect to any Campbell Scientific data logger that the LoggerNet server can communicate with. View real-time data and stored data tables in a numeric or graphical format. Collect data from LoggerNet’s data cache, and store the data to a file on your mobile device. Use your mobile device to trigger a manual LoggerNet data collection from a data logger. Change the value of variables. Check important status information about LoggerNet and the health of your stations. Perform data logger maintenance, such as sending data logger programs, managing files, and setting a data logger clock. LoggerNet Mobile Connect is available for iOS and Android devices. You can download the app free of charge from the Apple Store and Google Play. LoggerNet Mobile Connect runs on iOS version 7.0 or later, and Android OS 4.0.3 or later. LoggerNet Mobile Connect requires LoggerNet Admin version 4.0 or standard LoggerNet version 4.4. Keep in mind that your LoggerNet server must be accessible via TCP/IP from within the network over which you are trying to connect. This may require changes to firewall or other settings to allow outside access to the PC on which LoggerNet runs. We’re excited about this new addition to our LoggerNet family and hope you are too. Head on over to the Apple Store or Google Play to see screenshots, or to download the app and give it a try. If you think LoggerNet Mobile Connect will be useful for keeping an eye on your LoggerNet network, leave a comment and tell us about it. Dana, Loggernet Mobile is wonderful. I really enjoy its functionality. I have found one disapointment however, there does not seem to be a method of enteing a negative number when changing a variable. We work in the world of water monitoring and control, this feature would be very helpfull to us if possible. I would also like to know if it is possible to change the Port ID for loggernet, I have two desktop computers behind one router with a static IP and would like to be able to access either one or the other loggernet programs. I have them separated by entity since they are not releated to each other. Great App! I confirmed with our developers that the keyboard available for entering values is controlled by the mobile device itself, and not LoggerNet Mobile. On my Galaxy S3, the keyboard that comes up when I edit a variable has one key that displays a decimal and a minus sign. It took me a few tries to figure out how to enter the minus (double-clicking the key, which seems a bit odd for an Android device). There are third party keyboards that you can install. One of the developers tells me he uses SwiftKey Keyboard -- it offers a full calculator-type of keyboard. Thank you for your positive comments about LoggerNet Mobile. I'm glad you are finding it useful! Let me know if I can be of further help.